A new book and documentary just released this week are making some big claims. But Bible scholars and archaeologists are casting an enormous shadow of doubt on the authors' conclusions as more is learned about the facts behind their hypothesis. Discovered during foundation work for an apartment building near Jerusalem in 1980, the tomb was surveyed, and various artifacts, including 10 ossuaries, were removed by the Israel Antiquities Authority (IAA). The excavation yielded little that was considered especially noteworthy at the time, as the IAA subsequently reported in its Journal ‘Atiqot. In the meantime, however, Israeli-born writer and filmmaker Jacobovici launched an investigation of his own. The lynchpin in his identification of the tomb is his interpretation of the name on one of the ossuaries as “Mary Magdalene.” In Greek, as opposed to the Hebrew of the other inscriptions, is the name Mariamenou, followed by Mara. Mariamenou is a diminutive form of the Greek Mariamene and is a term of endearment. It is derived from the Hebrew Miriam, which we know in English as either “Maria” or “Mary.” Mara is normally a contraction of “Martha” (L. Rahmani, A Catalogue of Jewish Ossuaries). The two names are separated by a stroke, which was used in place of a preposition when two names appeared. Mariamenou is in fact the genitive form of Mariamenon and is found only here in the extant evidence for ancient Jewish names. It is a specifically Greek formation, not used in Hebrew or Aramaic, and indicates that this woman came from a Greek-speaking family, perhaps generations removed from her Hebrew or Aramaic relatives in the tomb. This point is overlooked by the documentary team, who present all the names (except for the other Mary, whom they identify as the mother of Jesus, and “Judas, the son of Jesus”) as belonging to a single generation. In fact, the IAA archaeological report notes that at least 35 bodies had been interred in this grave, indicating that it was at best a multigenerational family tomb. But what of the second name on the ossuary? The filmmakers wish to read the second term, Mara, as the Aramaic word for “Master,” thus reading the inscription as “Mariamene, also called Master” (in accordance with a current perception of Mary Magdalene as leader among the apostles). This translation of Mara is based on the notion that Mariamene was Mary Magdalene, which in turn is based on a work known as the Acts of Philip, a noncanonical document dating from at least 300 years after the time of Jesus and the apostles. It was written to be read at celebrations in Philip’s memory for the purpose of highlighting his saintly acts or deeds—deeds that have no basis in the New Testament. 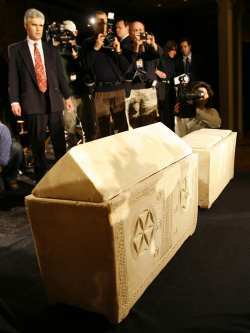 A woman named Mariamne is featured in the Acts of Philip, a fact that is being presented by Cameron as a vital clue to Mariamene’s identity, and one that the Israelis would have been unaware of in processing the tomb in 1980. But the Mariamne in the Acts of Philip is identified as Philip’s sister and possibly also the sister of Martha. The conflation of this Mariamne and Mary Magdalene results from a tenuous link in Gnostic literature written at the earliest in the second century. What’s more, the Mariamne that is identified with Mary Magdalene is not even the same name as is inscribed on the ossuary. Similar though they are, Mariamne and Mariamenon were unrelated names. So this can hardly be used as evidence linking the name on the ossuary with Mary Magdalene. The simple reading would be that this was the ossuary of a woman named Mariamenon, who was also known by the Hebrew/Aramaic name Mara. Mary, Mary? Quite the Contrary!